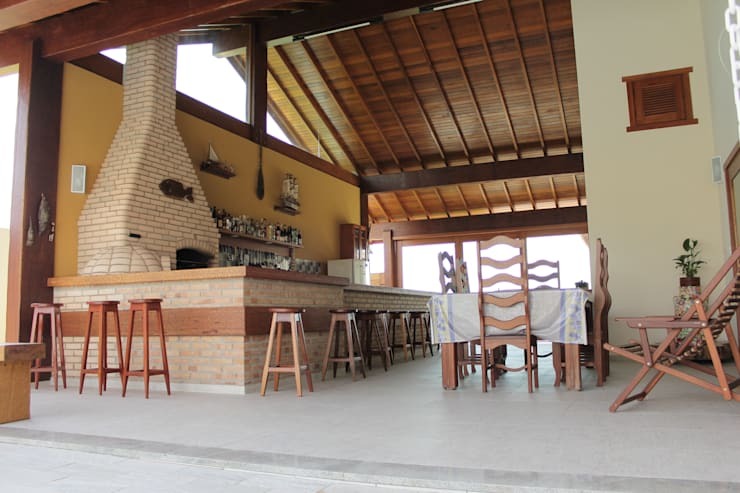 Today, we are going to visit Brazil where design professionals Canatelli Architectural Design have created the most beautiful and cosy family home, using wood and stone as the dominant materials. For South Africans, this home is a wonderful example to follow because it speaks to the rustic style that so many of us enjoy. Yet there is still a wonderful balance between the rural and the contemporary. 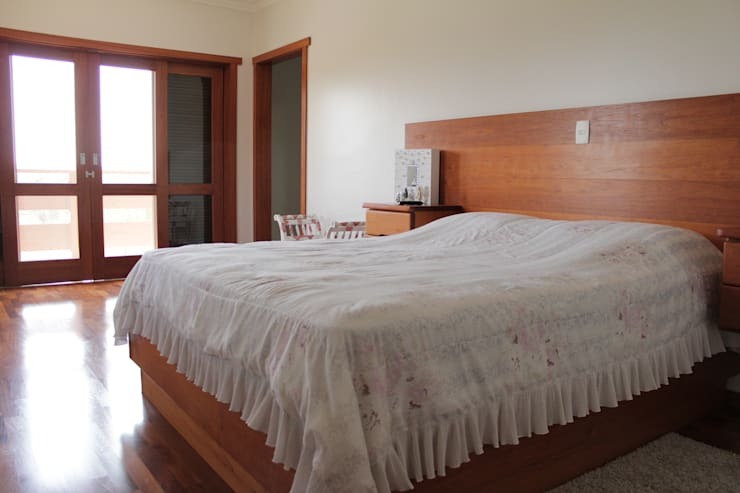 As we explore this home, we will also see how comfort and style can work in harmony. We'll also stumble across a beautiful swimming pool! 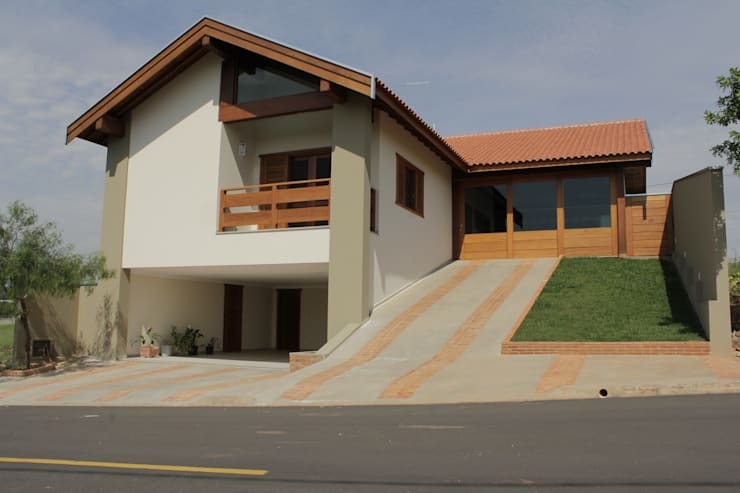 The Brazilian climate is also very similar to the South African climate, which is why the house is so relevant to our culture and our weather conditions. You'll love this architecture and design! The front of the house is very warm and welcoming, with a smooth pathway that leads up to a wooden front door. Remember that your entrance is the first impression that people will get of your home so you want it to be appealing and warm, which is exactly what the designers have achieved here. If you aren't sure how to create the same kind of warm and welcoming entrance, have a look: 7 impressive for your entrance. The wooden door works in harmony with the beautiful soft, earthy and neutral tones while the gorgeous front garden completely illuminates the beautiful warm tones. 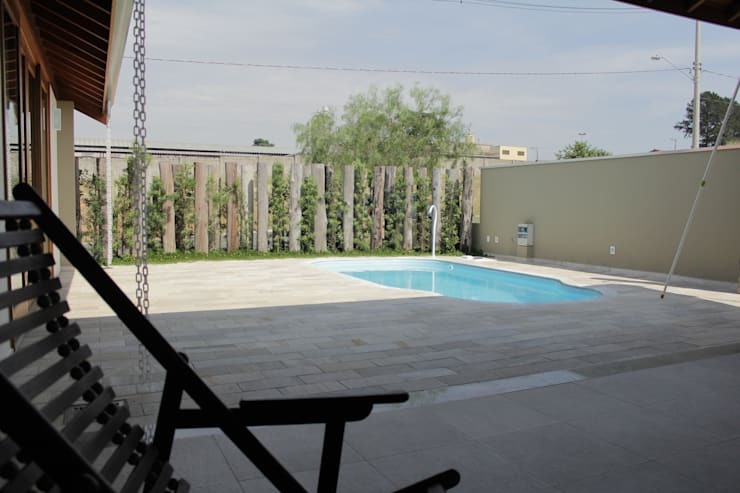 If we take a peek outside to the back garden, we can see how the property is expansive and stylish with a swimming pool! For South Africans, we know how important it is to have a swimming pool where we can cool down in the summer months or play with the kids. The large terrace spills out onto the pool area, creating a fabulous outdoor area where the family can relax and enjoy the sunshine and fresh air. Tip: Bricks are a great material for this kind of space as they are durable and hardy and will last in all weather conditions. The kids also won't slip while they are running around the pool. Now this is a terrace that South Africans could get used to! It features a covered bar area, kitchen and dining room, where you are protected from the beating sun or rain, but you still have direct access to the outdoors. Couldn't you imagine hosting afternoon lunches out here? Here we truly get a sense of how the different materials work together. The raw cement floors, wooden furniture and roof and brick and stone features create a very rustic yet homely design with warm colours and an array of textures. The designers have also paid close attention to detail, adding little ornaments and pieces of art to the space that create character and charm. The living room shows us how comfort and style can collide. The living room features a cushy rug and a plush sofa, which creates the perfect area for relaxing with a good book, playing games with the family or watching a film. Here we can also see how the natural materials create a very homely and cosy interior space. 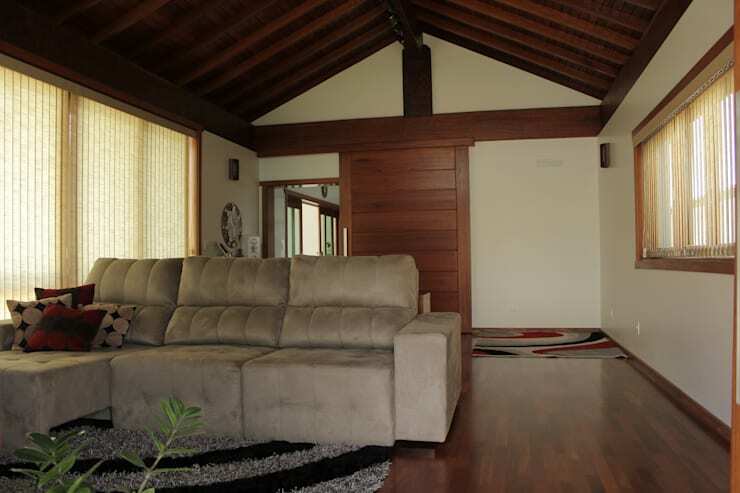 The wooden floors and wooden ceiling beams make for a very special and earthy interior design. 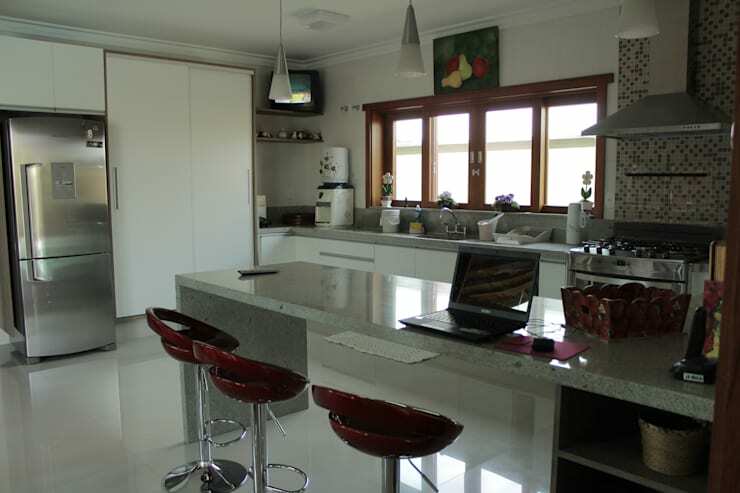 The kitchen is a little more modern and sleek with predominantly white tones and granite counter tops. The breakfast bar with the little red bar stools create the ideal focal point for the family to come together over cups of tea or bowls of cereal in a more casual setting. It also subtly separates the kitchen from the rest of the living area while providing an extra surface space for preparing food. The kitchen also features an abundance of storage space, which ensures that all cutlery and crockery is stored neatly out of sight. This keeps the kitchen looking minimalist and organised, making it seem that much bigger and more appealing. The bedroom is one of our favourite rooms in the house, because it shows how simple can be the most sophisticated. The wooden features are the star of the show, which have allowed the designers to keep everything else very subtle and simple. You'll also notice that there isn't anything in this room that isn't necessary or functional. This is a great example of how less is more as well as how wooden touches make for a very peaceful and ideal interior setting. In this image, we can see how the interior of the home is connected to the exterior of the home, spilling out onto large balconies and exterior spaces. The home also features a spacious double garage, where cars, bicycles and other items can be stored neatly out of sight. This is a wonderful feature for any home, keeping cars protected from the weather conditions while maintaining a very neat and tidy looking facade. If you like this home, you'll love these: 10 great wooden houses. 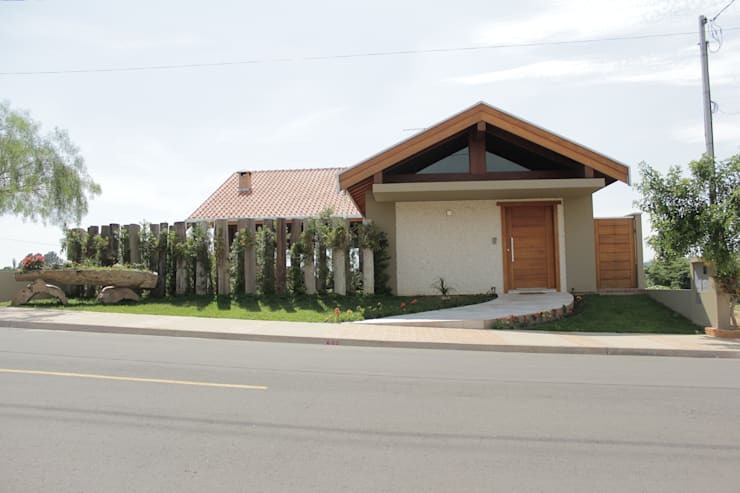 Do you think that this home would look good in a South African neighbourhood?